Easy with some significant elevation. This walk to most locals it is also known as the “green line” as the walk is marked literally by a green line that meanders through the city. 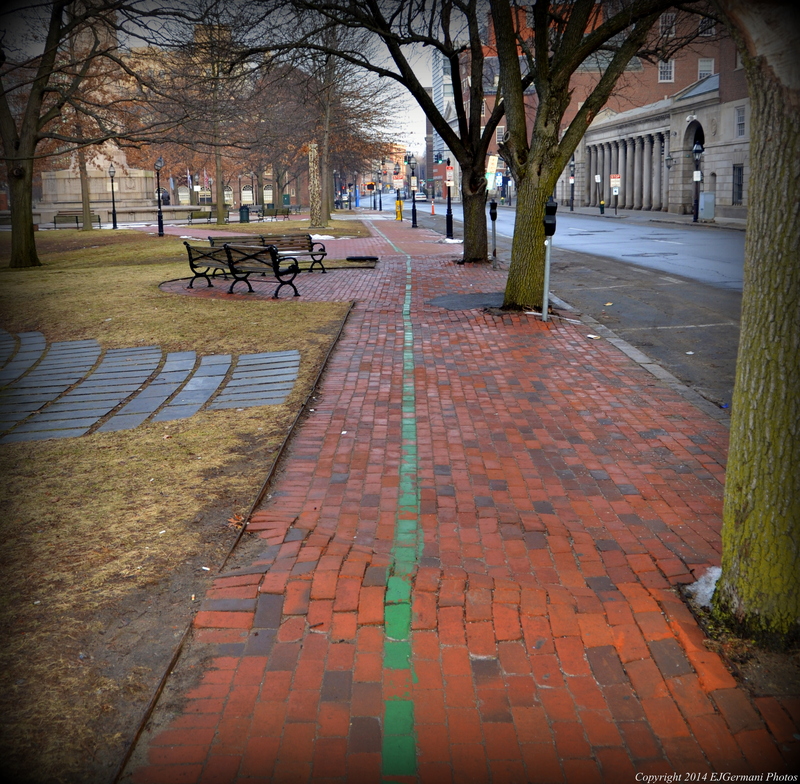 The Independence Trail is similar to the Freedom Trail in Boston in its amount of rich history. Most people are unaware of how much history is here in Providence. In fact, some of it predates the history of Boston. Unlike the Freedom Trail, the Independence Trail is a loop. You can start at any location and finish where you began. The trail is also marked with site numbers. At each site number you can use your phone to call the number given for a description of the site. This morning I started along South Main Street at the Cable Car Cinema. (Currently, meter street parking is free on Sundays.) I started my walk heading north along South Main Street going through an area of spires and steeples. I passed the Old Stone Bank building with its gold dome as well as the Supreme Court Building, both on the right, and Memorial Park on the left with its host of war memorials. Continuing north I soon passed the Old Market House. Providence had its own tea party in rebellion of British taxes. A plaque here explains it. Continuing north, (this is where South Main Street becomes North Main) I passed the Rhode Island School of Design Museum before coming to the locally famous bus tunnel. Next I came to the First Baptist Church. The church was founded by Roger Williams (the founder of Rhode Island) in 1638. A little further up the road I turned right and uphill on Meeting Street. I first came across a single room brick schoolhouse the was once used by Brown University. At the intersection of Benefit and Meeting Streets is the Old Armory. At this location my College Hill walk intersects this walk. I then turned left onto Benefit Street before turning left and downhill on North Court Street passing the Old Rhode Island State House. In this building on May 4, 1776, Rhode Island declared its independence from the British. Rhode Island was the first colony to do so, a full 2 months before the Declaration of Independence. After going to the bottom of the hill I crossed North Main Street and followed the sidewalk north along the Roger Williams National Memorial. This is the site of the spring in which Providence was settled and grew around. I then turned left onto Smith Street crossing Canal Street and the Moshassuck River before making my way to the State House. (Note: the green line is not present on State House property. To continue the trail, walk towards the State House and follow it around the left side balcony to the stairs in front and down the main walkway to Francis Street.) The State House is a massive marble building built at the turn of the last century. It has one of the worlds largest unsupported domes. If it is open, it is well worth going in to take a peek at it from inside. Atop the dome is the Independent Man. This statue overlooks Providence. Making my way down Francis Street heading toward downtown I passed the Providence Place Mall. Some of the cities newer building are to the left surrounding the basin of Waterplace Park and the Woonasquatucket River. Following the green line into downtown, I soon passed the Biltmore Hotel, Providence City Hall, and made my way into Kennedy Plaza. The green line took me by the ice skating rink, BurnsidePark, and the Federal Court House as well. At the Federal Court House there is a plaque commemorating that Abraham Lincoln had once spoke here at the Railroad Hall. From here I followed the trail down Exchange Street into the heart of the Financial District. Here I was surrounded by some of the cities tallest buildings including the famed Turks Head Building. I then made my way up Westminster Street to Dorrance Street passing the Industrial National Trust Building and The Arcade (the worlds oldest indoor shopping mall). Turning left at Dorrance I passed a plaque of the Federal Reserve building that shows the height of the flood waters from the 1938 Hurricane. I then turned left onto Weybosset Street back toward the Financial District passing The Arcade again. I then followed the trail right after The Custom House Tavern to the Crawford Street Bridge. At this location my Waterplace Park walk intersects this walk. I then followed the trail along the Providence River for a bit before heading up Planet Street and back to the car. This walk not only showcases the vast history of Providence and Rhode Island, but it is a walk through some of the most elaborate architecture in the nation, both in style and age. This walk also brings you by some of the interesting art work and sculptures in the city. I would suggest taking your time on this walk as there is so much to see. I started this New Years morning walk from the bottom of College Hill at the intersection of Benefit and Wickenden Streets. A very cold and quiet morning indeed being a holiday morning. I passed some of the oldest colonial era houses in the country as I made my way up Benefit Street. Many of them have plaques showing the date they were built. The architecture in this part of Providence is just downright beautiful. Along this stretch I also passed The Barker Playhouse, The Hoppin House, The John Brown House, The First Unitarian Church, The Superior Courthouse Building, and The Athenaeum before turning right and uphill on College Street towards the famous Van Wickle Gates of Brown Univeristy. At the top of the hill I then turned left on Prospect Street passing the Carrie Tower. The dome ahead is the First Church of Christ Scientist. I then turned left onto Waterman Street downhill back toward Benefit Street through part of the Rhode Island School of Design campus. There is a grassy area on the right with a sculpture in the middle. In warmer weather many RISD students are here sunbathing. It has become known to the locals as RISD Beach. Needless to say, no sunbathers today. When I got back to Benefit Street I turned right and followed it to Meeting Street passing behind The First Baptist Church and The Marine Corps Arsenal. At Meeting Street I turned right and followed it uphill to the end of the road. At the end of the road there is a set of stairs that lead you to Congdon Street. At this point I turned left and still uphill until I reached Prospect Terrace Park. At this park there is a statue of Roger Williams, the founder of Providence, that overlooks the city. 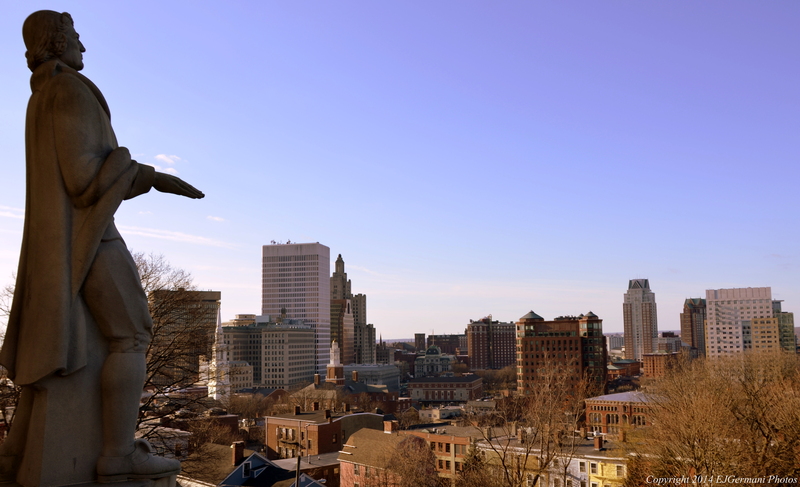 From this vantage point you can see most of the city and its landmarks including the Rhode Island State House, Providence City Hall, The Biltmore Hotel, the steeples of The First Baptist Church and The Washington Trust Company, as well as the skyscrapers of the Financial District. After leaving the park I made my way up Bowen Street. After a block I reached the peak of this walk. The rest would be downhill. Bowen Street offered many home of various architecture as it skirted the Brown University campus. I followed Bowen Street to Thayer Street where I turned right. This stretch is usually bustling with activity. Again being early morning on a holiday, Thayer Street was as quiet as I’ve ever seen it. The next quarter mile is a cluster of small shops, eateries, and coffee shops. Although mostly corporate now there are still some Mom and Pop shops left here. I continued down Thayer Street through the heart of Brown University and followed it to the end at Transit Street. Again the architecture in this area is stunning passing several more colonial era homes. I turned left onto Transit Street before turning right onto Brook Street where another small cluster of shops are mixed with very old homes. I then turned right onto Wickenden Street passing several restaurants before making my way back to the car I had parked near Wickenden and Benefit Streets. Providence has been going through a metamorphosis for the last 25 or so years and much of the area described in this walk has seen most of that change in the last few years. In fact some of that change is still happening. With that being said the description for this walk starts from the Community Boating Center along India Street and heads west towards the I-way Bridge. The reason being is that small stretch along India Street passes through an area that hasn’t been redeveloped yet and is still somewhat of an eye-sore. After passing the Community Boating Center you will pass the remains of what was once a bustling nightclub and marina that closed long ago. Shortly after that is the Providence Steamboat property, home of several tugboats that assist large ships entering Narragansett Bay. Most times at least one of the several tugs are docked here. The walk then turns right onto Bridge Street and travels under the I-way Bridge. The 400 foot arch is 80 feet high and serves as an appealing entrance to the upper Providence River that carries Interstate 195 over it. The bridge was built in 2007 as part of a project that relocated a mile and half stretch of Interstate 195 just south of the city. From here, across the river and just south of the bridge is Collier Point Park. Just north of the I-way Bridge is the Fox Point Hurricane Barrier, the first of its kind built in the United States. The structure built in the 1960’s protects downtown Providence from storm surges. Two hurricanes in the 20th century, being in 1938 and 1954, inundated the city with several feet of water. The city has not flooded since. After passing through the hurricane barrier there is a small park to the left. Every Columbus Day weekend the Pronk parade concludes here and the festivities carry well into the night. Across the river is one of the most recognizable and photographed structures in Providence. The Manchester Street Power Plant, with its towering stacks, creates electricity using three large turbines fueled by natural gas. The portion of the building to the extreme right is part of the original structure that was once fueled by coal. The newer portion of the building was built in the 1990’s. For those of you interested in checking out the city from the river, stop by the dock just below the Hot Club deck. Here is the home of the Providence River Boat Company. Tours of the city leave here on an hourly basis on most days. If you need to wait, grab a burger and beer from the Hot Club. (Trust me!! They are good!). Also along this stretch of Bridge Street is Lola’s and the Whiskey Republic. Across the street is Corliss Landing, one of the oldest buildings in the area, now mostly apartments and offices. At the end of the street and to the left is the Point Street Bridge. It was built in 1927 and is a swing bridge. It last opened in 1959 as the upper Providence River was no longer used by larger vessels. This walk now turns right and heads away from the Point Street Bridge, first crossing South Water Street and then South Main Street before turning right onto Benefit Street. This large open area was where Interstate 195 once snaked through the city. Some of the parcels are put aside for parks and others are slowly being redeveloped. After following a small section of Benefit Street a short bike path lies ahead. To the left is the backside of the Holy Rosary Church, another of Providences predominant structures. The short bike path starts a curve to the left keeping the South Main Street exit to the right and a small grassy area with artistic sculptures to the left. The bike path soon ends at the sidewalk of George M. Cohan Boulevard. This now fairly quiet street once served as the main through-way from the Point Street Bridge to points east. It was named after the playwright, composer and producer who was born in Providence. The 1942 Academy award winning film Yankee Doodle Dandy depicts his life. Following the sidewalk for a few hundred feet slightly uphill you soon come to the India Point Park Bridge. Turning right here you now cross the Interstate before entering the park. From the bridge you have good views of the upper reaches of Narragansett Bay. 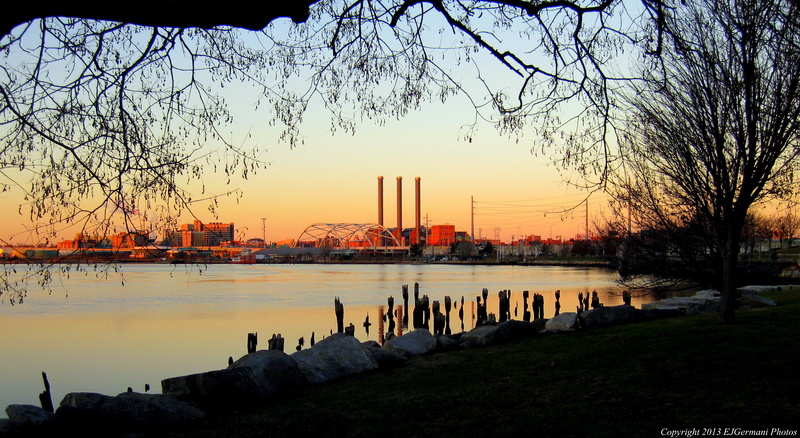 India Point Park has an interesting history of its own. It once served as a seaport, a crossroads, and lastly a metal scrap yard before becoming a waterfront park in the 1970’s. After crossing the footbridge, turn to the left and follow the paved footpath. It comes close to India Street before turning away from the street. You will find an interesting sculpture here of yesteryear. Next you will come to the entrance of the East Bay Bike Path. If you so choose, the bike path takes you up onto the Washington Bridge for a sweeping view of the Seekonk River below. After passing the entrance of the bike path continue straight and then stay to the left of the playground. At the next footpath turn right and follow it to the end. This will lead you to one of the least known, but most important historical sites in Rhode Island. This is where the founder of Rhode Island, Roger Williams, first step foot in Providence in 1636. He would later travel around India Point and Fox Point and then up the Providence River where he would found Providence. The path now turns south following the Seekonk River. In this area, over time, were several river crossings including a covered drawbridge that was built in 1793. All that remains today (other than the existing Washington Bridge) is the remnants of the India Point Railroad Bridge on the East Providence shoreline. This area of the park was at one time a rail yard. In fact the first railroad station built in Providence was built here. The remainder of this walk follows the shore of the river, passing the playground once again, before coming to a large wooden dock. This area once served as a seaport for larger vessels that couldn’t make it to the docks closer to downtown. Near the conclusion of this walk is a newer dock. It it is used primarily by recreational fishermen. You will find several informational boards throughout the park further explaining the vast history of this area. Downtown Providence has a wealth of history and this walk will take you through some of that history. For this walk I started at the south end of the Riverwalk along South Water Street just by the former heliport pad. I then followed the Riverwalk northerly passing a plaque marking the site of the seaport that was once used for slave trade. Further ahead there is a spot to launch canoes and kayaks and just beyond that is the first of many sculptures along the river and surrounding area. I then crossed the pedestrian bridge at Crawford Street to the west side of the river. Looking south down the river you will see the Point Street Bridge, the triple towers of the Manchester Street Power Plant, as well as the bow string arch bridge locally known as the I-way Bridge, and the Fox Point Hurricane Barrier. I then turned left following the Riverwalk through the Irish Famine Memorial and the Remembrance Garden before following the walkway to its end. I then retraced my steps back to the pedestrian bridge and continued straight, crossing Crawford Street, then following the sidewalk along Memorial Boulevard that overlooks the river. At one time this area had the distinction of having the worlds widest bridge as most of the rivers were built over by roadways. A massive revitalization of downtown made the rivers the focal point and a center of art, culture, and memorials. After crossing Steeple Street I found my way down a set of stairs to walk along the river again into Waterplace Park. The walkway follows the river to the Basin. Along the way there are “black baskets” in the river. These are used for Waterfire. It is an event the takes place various weekends throughout the year when the river is “set on fire”. Along this stretch of river it is common to see gondola boats and sightseeing boats cruising through Waterplace Park. At the basin there is a walkway that goes under Memorial Boulevard to the old Union Station building. In this tunnel is the Wall Of Hope. It is a September 11th memorial that has taken permanent residence there and was to be relocated at a time in the past. I then made my around the basin. From here you can see some of the iconic buildings of downtown, both old and new. The sprawling Providence Place Mall, the white domed Rhode Island State House, the Biltmore Hotel with its famous red rooftop sign and glass elevator, the old Union Station, and the Industrial National Bank building (sometimes referred to by locals as the Superman building) to name a few. After circling the basin I made my way along the walkway passing the fairly new Waterplace Luxury Residences and the Citizens Bank Building. I then crossed Steeple Street once again and went down into a small section of walkway where the three downtown rivers meet. The river to your right (that you’ve been following) is the Woonasquatucket, the river to your left is the Moshassuck, and the river ahead of you is the beginning of the Providence River. To your right on the wall across the river you will notice a series of dates with a line at each. These mark how high the water rose during the hurricanes that flooded Providence in 1815, 1938, and 1954. The 1938 hurricane was the worst to hit the area with the 1954 hurricane being as close in power. In the early 1960’s the hurricane barrier was constructed and completed in 1966. The city has not flooded since even with significant hurricanes in 1985 (Gloria), 1991 (Bob), 2011 (Irene), and 2012 (Sandy). I then made my way over the Moshassuck and turned right onto the walkway (formally a section of Canal Street) pass some of the oldest buildings in the city. At the Old Market House there is another plaque showing the depth of hurricane flooding. This one you can stand next to. It puts it in perspective. The walkway then continues along the river passing the World War One, World War Two, and Korean War memorials. I then crossed South Water Street at Crawford back to the first section of the riverwalk and retraced my steps to the car.